So, what exactly are freezer meals? To clarify from the beginning, by freezer meals we mean home cooked meals, prepared ahead in multiple portions and frozen for later use. What are the Advantages of freezer meals? Specifically of buying in bulk and planning ahead for a week? You end up eating whole and diversified healthy foods. Why have we chosen Freezer Meals? Because my husband and I are mostly eating bad food, we are gaining weight and spending a lot of money on this. Now, the occasional comfort food is fine, but our main problem is not planning ahead for food and this it is making out life so much harder. Not having a meal plan makes us buy things that end up being useless or going bad. On the other side, planning daily for each lunch and dinner required us to make decisions, go shopping very often, take time to prepare everything and even spoil a lot of food that doesn’t get used. Add our 12-month toddler, my new pregnancy, or the house chores to the mix and I ended up with really no time to pursue anything else than the household and food. So in order to get time for my projects as well, we ended up with pizza or Chinese, burgers, chips or ice cream from the supermarket. You name it, we’ve tried it. Being a busy mom and still trying to make sure that we all eat healthily is not easy and we’ve slipped into easy/unhealthy options too many times. I was honestly even feeling super guilty for not being able to handle this. So I decided to really troubleshoot until I put an end to this. So, the problem! First of all, take out or junk food happens especially when we roam the kitchen and there’s nothing interesting there to eat. So the empty fridge is the trigger. Then we either order take out or we go on a hungry trip to the supermarket, which ends up in a disaster basket, containing a bunch of mega unhealthy food, either super processed or too salty, sugary and filled with trans-fats. The solution: I was on Pinterest all along, and it’s Freezer meals and a bunch of good planning! I ended up choosing the recipes that I know both me and my husband would like to eat, I cooked them in a batch for like a whole week and froze them. And taa-daa! Now we have super delicious healthy meals to choose from all the time! I’ve been doing this just for a month and it is transforming everything – from the budget spent in the supermarket, to the quality of the food we eat and the free time I got. I would not have had time to put my blog together, practice graphics and CSS and work for my clients if not for this hack. 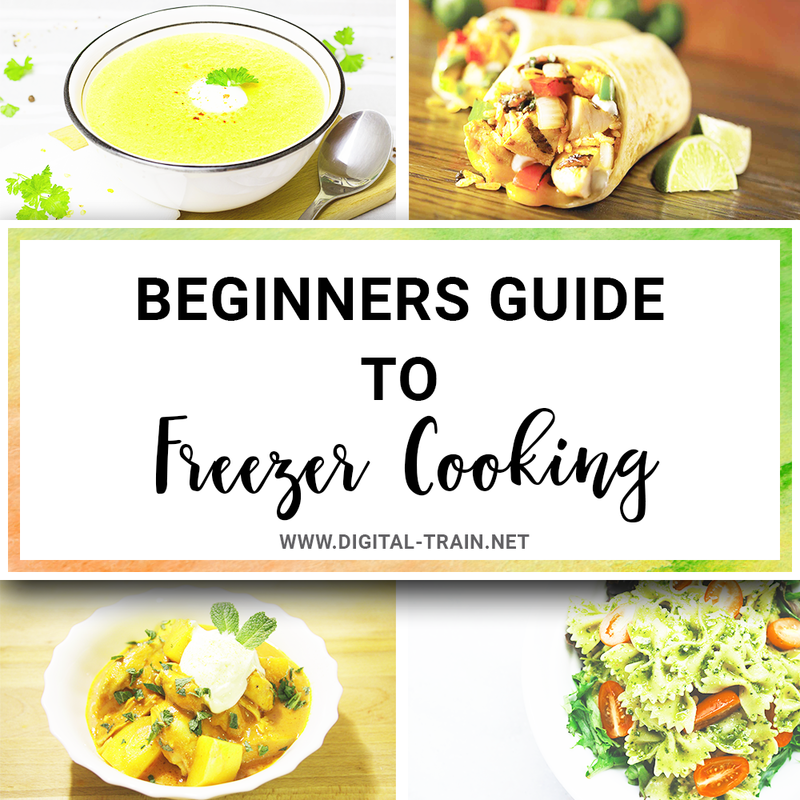 How can you cook freezer meals? One way to do this is to just double or triple the amount you would normally make for your family when you’re cooking dinner, eat one fresh and freeze the rest. Another way would be to do it like I did the past month, arranging a slot of 4 hours to cook 30 meals at once. What are some recipes to use? I have personally tried so far the following recipes, (with some personal tweaks like, uhmmm, bacon in the breakfast wraps) and they were all delicious. You have a wide choice here, but the common ones are freezer friendly storage containers, wraps or plastic bags, such as Ziplock® or similar brands. For storage containers, I’ve seen bloggers use disposable aluminum containers, glassware, plastic or even collapsible silicone ones. You should pay attention to handling glass containers as there is breakage risk. If you would like to freeze in jars, here are Kristen’s in-depth tips on how to do it. I’ve personally chosen so far to wrap my tortillas in aluminum foil and I use Ziplocks for meats. I’ve stored the cooked food in plastic lid containers that are also microwave friendly and I am now researching into switching to glass containers and I’m also curious about testing the plastic collapsible ones. Flash freeze some items that you don’t want to lump together, such as chicken strips. How much can you keep them in the fridge? Depending on the item that is frozen, from 1 month to 12 months. Check out the U.S. Food Safety Chart here for more details. How to serve freezer meals? In the fridge – the safest method of defrosting food is to put in the fridge overnight. It will typically take a fully cooked freezer meal 24-48 hours to completely thaw, depending on how thick it is. It takes uncooked meats about 24 hours to completely thaw. In water – if they are in an airtight container, you can also speed up the process for meats or soups by defrosting them in cold or lukewarm water. In the microwave – the fasted method. You can ideally start on defrost and move your way to a higher temperature after a few minutes.